Between Shubhash Ghai’s Yuvvraaj, a damp squib at the box office in the first week of its release, and the other two big-ticket year-end releases—Shah Rukh Khan’s Rab ne Bana di Jodi (12 December) and Aamir Khan’s Ghajini (25 December)—are two weeks that belong to the small film. Considering 2008 has been the year of the small film, we look at the what and who of these multiplex capers. Behind the camera: Produced by UTV Motion Pictures and directed by Dibakar Banerjee, whose debut film Khosla Ka Ghosla, also set in Delhi and about a family’s predicaments was a surprise multiplex hit of 2006. Look out for: Banerjee’s sympathetic and humorous take on Delhi’s middle-class milieu, Abhay Deol’s portrayal of Lucky, and Paresh Rawal’s multiple performances. Oye Lucky! Lucky Oye!released on 28 November. The story: An adaptation of a play of the same name, the movie, about a day in the life of six Indians who compete for a chance to meet American president George W. Bush, has been made by Sippy Films (Ramesh and Rohan Sippy). They are the voices of new India and thus shortlisted to tell Bush what being that means (the true story is, of course, that some young Indians did meet Bush when he visited India in 2006). At the heart of this out-of-the-box comedy is Maya Roy (Konkona Sen Sharma), a Bengali social activist vying for the opportunity. Behind the camera: Produced by Sippy Films and directed by debutant Kunaal Roy Kapoor, who also directed the play. Look out for: The political statements inherent in the theme and dialogues, the documentary style shot-taking and Konkona Sen Sharma’s performance. The President is Comingreleased on 28 November. Behind the camera: Produced by Vashu Bhagnani, and directed by Onir, whose first film My Brother Nikhil (2005) got lukewarm reviews and box-office earnings. Look out for: The pre-release buzz was about Singh’s comeback (she had gone into hibernation after her performance in Sudhir Mishra’s 2003 film Hazaaron Khwaishein Aisi). Azmi, playing an embittered, possessive mother and Irani’s goofy antics are the scene stealers. Sorry Bhai! released on 28 November. The story: Nana Patekar plays the role of a small-town self-made millionaire, Govinda, owner of numerous trucks, and smitten by his wife (Rimi Sen). He saves Ajay, a young photographer, from committing suicide after his girlfriend marries someone else. Govinda takes Ajay under his wing, and helps him plot the murder of his former girlfriend’s husband. But the joke is really on Govinda, because Ajay has, meanwhile, fallen in love with the wife of the trucker millionaire. Behind the camera: The makers are unknown names and labels: produced by Sunrise Pictures and directed by first-time director Rakesh Narang. Look out for: We are stumped— the crew is new, so is the director. But going by the trailers, the film’s big draw is going to be Patekar. If his brand of histrionics appeal to your comic sensibility, it’s your kind of film. Horn ‘OK’ Pleasssreleased on 5 December. The story: Nikhil Dwivedi, last seen in the charming My Name is Anthony Gonsalves earlier this year, plays a rich hotelier who decides to bomb a rival hotel. The lives of the hotel’s guests—eloping lovers, underworld dons and many others—are obviously endangered. These circumstances test their friendships and loyalties, from which the director hopes to make a situational comedy. The cast includes actors Rajpal Yadav and Chunky Pandey. Behind the camera: Produced by Azam Khan and directed by Ajay Chandok, who made some forgettable films such as Nehle pe Dehla and Team in 2007. Look out for: Chandok was David Dhawan’s assistant director in Coolie No. 1 and Hero No. 1, and carries that tradition of slapstick forward, but with a modern twist. Go only if 90 minutes of slapstick made out of violence in Bollywood style, especially in these times, hold your attention. Behind the camera: Produced by Shailesh R Singh and Studio 18, and directed by first-time director Anil (Sharma) Senior. Look out for: The stellar cast, especially Irrfan Khan, who, going by the trailers, is effortless as a torn, apologetic husband. Dil Kabaddireleased on 5 December. Behind the camera: Pritish Nandy Communications, an ace player in the multiplex arena, and director Chandrakant Kulkarni, known for his Marathi films. 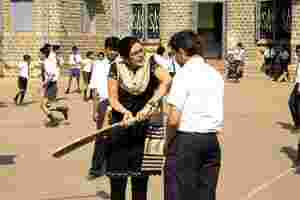 Look out for: Will Mandira Bedi tone down her real life role as a glamorous ambassador of the game to portray a gritty chawl girl? The Mumbai-specific humour is being talked about too, as is the cameo by Anil Kumble. Meerabai Not Outreleased on 5 December.